A verification code is a security protection method used by form owners to avoid Internet robots from abusing and spamming their web forms. There are different verification code types, but the most common used is CAPTCHA and Smart Captcha. A random generated code appears in an image above a textbox where the visitor has to type the exact code in order for the form information to be sent. Each time the form is accessed, a different code will appear. Owners can deactivate the verification code of their web forms, although this would increase the vulnerability of the forms to spamming attacks. The verification code is linked to the entire form, so if it is not completed properly, the information of the web form will not be sent. 123FormBuilder encourages its users to use verification codes whenever possible on their forms. You can find the option in the Settings → Security section of the web form within the 123FormBuilder account. Hello how can I make a verification code? Verification codes are automatically and randomly generated, you would only need to select the desired type from within the Edit section of the form. 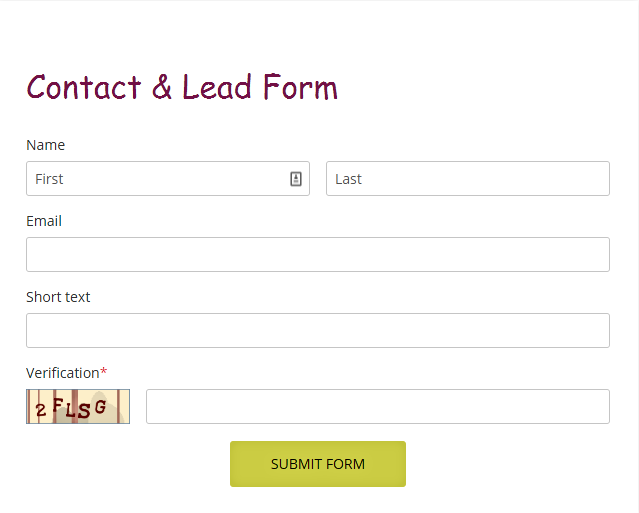 If you are referring to the Verification Code at the bottom of the form, then the code is automatically generated for the users to fill in before submitting the form. The most common are the ReCaptcha and the Smart Captcha. If you need more information about this subject please contact us at support@123formbuilder.com. We will provide you with all the details. I want to put the cod verification feature in my website….but d’ont know the code…can u help me with this? You can activate the Verification from Settings–>Security section of your form. We advise you to choose the ReCaptcha or the Smart Captcha which are the most commonly used. The verification code is automatically generated for each user that goes and submits the form. Therefore it’s not a code you must implement yourself. If you need further assistance, please send an email to Support@123formbuilder.com and the team can provide you with more information. How to recovery my verification code? The verification code is a security feature and is generated automatically, but is not stored anywhere. You can enable or disable the verification code option form the Edit section. If you have any other questions you can contact our Support team at support@123formbuilder.com, or, via our contact form. I want to go live on YouTube and it says verification code and I don’t know what to input. Is the verification code used not being accepted? If so, you should clear your browser’s cache and cookies before using the verification code. For any other questions you might have, please contact our Support team at support@123formbuilder.com, or, via our contact form. I am wondering how I can deactivate the verification code on my forms? Please follow our documentation here http://www.123formbuilder.com/docs/what-is-smart-captcha/. You can disable or enable the Captcha on your form in the Settings → Security section. For more questions or assistance, please contact our Support Team at support@123formbuilder.com or via our contact form. How is my form data secured and processed? Is 123FormBuilder compliant with the Data Protection Act 1998? My form is set to accept submissions from my country but I can’t access it. Why? Can I limit form submissions from the same IP? How do I remove the verification number? I enter the correct verification number, but the form does not accept it. Why? Do your services have integrated anti-spam solutions?